Are Mourinho's Chelsea brilliant or riding a huge wave? Every year some teams seem to click. They embark on long undefeated runs and record impressive victories. The media get excited and players win awards. They might even win titles. On some occasions this is an accurate reflection of a team’s quality, but on others it’s a comparatively brief flirtation with the desirable end of random variation. So this year, are Chelsea a decisively good team or are they just riding a huge wave? Let’s find out. It was easy to get irritated by some of the media fawning over Chelsea as they skated happily undefeated through Autumn. Fabregas fed Costa repeatedly and the desire for a new team of ‘Invincibles’ led to a lack of wider critical analysis. Despite Mourinho’s CV being full of changes effected at a pace akin to the Fonz’s ability with jukeboxes, this time it had taken longer and only the shrewd recruitment of top class players, a neat trick available to very rich clubs, had seemingly raised Chelsea’s performance level. All hail Jose! So, where are we? 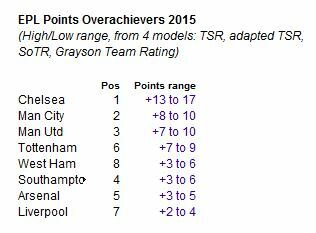 Nasri’s biased slight isn’t provably untrue, yet Chelsea sit contendedly and clearly on top of the league. City follow at a respectable distance. Why? Sometimes the glaringly obvious can stand clearly in front of you yet appear invisible. A finely honed contrariness and a tendency to try and look for nuance can leave you peering around the sides and neglecting the emphatic truth. Then you refocus and it hits you like a brick. Such a wave of simple realisation occurred to me earlier this week as I was pondering this season’s Premier League title race. Chelsea are that team. Every year we get at least one, and this year it’s Chelsea. Okay: a Premier League season consists of 38 games, which in the scheme of trends and variations is a small sample. Each season, within that small sample it is possible to identify teams that have over or underachieved when compared to what might be expected from baseline metrics. Most often, due to proven repeatability, these will be based around shots and their relationships with goals and/or points. What we’re looking at here is the top of the league and each season, of the contending teams, one or more learns to fly. We have representatives from each season here, 4 of 5 title winners and 3 of 5 runners up. Chelsea’s phenomenal 2009-10 title side ranks a clip behind (however, in raw terms, that team is way ahead of all other teams on the list). Also close up is the 2012-13 City side that meandered as Mancini edged towards the exit whilst Ferguson’s last team flew. Interestingly, the only top 2 team that has a mediocre ranking is Ancelotti’s 2010-11 Chelsea side, but with 71 points, it was a particularly low total for second place. Man Utd had it easy that year. Three teams from last season. Arsenal overachieved significantly against, for them, moderate underlying numbers and were nominally in the title mix for about two thirds of the year, Liverpool had a phenomenal attacking season but were pipped by Man City, who matched them going forward and held a decisive advantage defensively. What has this got to do with this season? This year we have a functional duopoly of Chelsea and Man City, two teams well matched by skill but divided by small degrees of random variation. In a neat reflection of core performance indicators, after twenty games, Chelsea and Man City had accrued identical records. Since then, their results have diverged and if we again look at projected points, we might be surprised that Man City’s totals bear greater resemblance to expectation than Chelsea’s. Projecting forwards, Chelsea 2014-15 are quite likely to end up ranking 3rd, behind only Ferguson’s last two squads at the top of the original table. This is an extremely high positive variance and when considering it is building on a contending base, it is highly likely to generate the title. From this, and knowing how similar City and Chelsea’s underlying numbers are, we can estimate that Chelsea’s advantage caused by random variation (or even luck depending on your inclination!) to be somewhere between 3 and 9 points. That they currently lead by 7 bears this out quite tidily. This year Chelsea have Diego Costa finishing chances at a rate of 28%. This is incredibly high, literally ‘Papiss Demba Cisse has hot feet’ high. His last two seasons were 25% and 20% which implies he may be an above average finisher anyway, rather than a Cisse-esque streaky converter. Liverpool and Man City last year had Suarez, Sturridge, Toure, Dzeko and Aguero all converting chances at extremely high rates. (In fact, Dzeko consistently appears high up in conversion rates, his long absences this term may well have impacted on City’s effectiveness.) Ferguson’s Man Utd teams had combinations of Berbatov, Rooney and Van Persie all scoring at high rates. All of the teams in the initial chart converted chances at a far higher rate than their opposition. This season both Chelsea have a conversion dominance of around 6 percentage points (14% for, 8% against), Man City’s is 2 percentage points (12% to 10%). Simply, Man City have not performed like Champions in this metric. 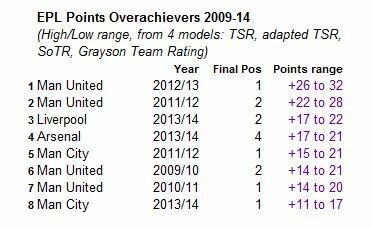 Interestingly, part of Man Utd’s continuing success despite performances can be explained here. Van Gaal has followed Ferguson here. Only time will tell if he’s able, like Ferguson, to sustain it over multiple seasons, a trend which possibly suggests tactical or systematic methods. The top 4 teams in my database for turning their shots into shots on target are the top 4 teams from the initial graphic. If Chelsea maintain their levels (38%), they will rank 3rd. 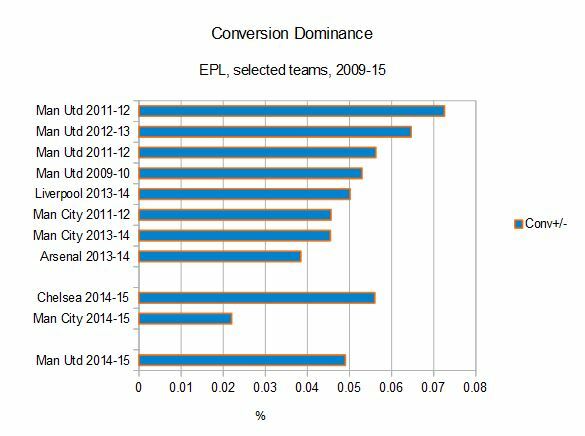 Chelsea’s current rate of dominance in this metric in relation to their opposition is 2% higher than anything else i’ve got recorded. They get their shots on target and they stop the opposition doing the same at a very high and likely unsustainable rate. Grayson’s Team Rating already cleverly incorporates a similar concept into it’s calculation and it’s clear that it is an important influence. Again, we find Van Gaal’s Utd scoring highly here; at least in the plus side. They rank 2nd in the league for turning shots into shots on target (37%) but intriguingly give up shots on target at nearly the same rate (36%). One might expect this to indicate potential problems but when those same shots on target are converted at 37% For and 25% Against, it looks like a big thank-you to David De Gea. Any hope for Man City? Man City are again this year, top class. Their issues, which start with the seven point deficit, could well be unsolvable given the tiny sample of 13 games remaining. They simply haven’t turned their clear quality into enough points. In nearly every game that they’ve dropped points, they’ve been the better team and have generated more shots and chances than the opposition. The random variation up until this point has given Chelsea what could well be a decisive lead and the only slight hope I can muster revolves around the Champions League. Mourinho seemed to prioritise the Champions League last year despite being in league contention; they lost to Villa, Palace and Sunderland in weekends prior to three of their six knockout fixtures and of course, famously won despite fielding a weakened team at Liverpool prior to another. It is ironic that Man City’s hope of rechallenging for the title may rest on their own departure from the Champions League and the continued progression of Chelsea in the same competition. The statistically best team of the enlightened stat era (2009-14) was, by some margin, Ancelotti’s 2009-10 Chelsea team. They scored the most goals, took a higher percentage of shots and shots on target, prevented the opposition doing anything much at all and only the sustained brilliance of Man Utd under Alex Ferguson stopped them winning the league with ease. This Chelsea team is a clear step below and maps very similarly to this year’s Man City side. Both are clearly a step above the opposition in the league this year but compare only adequately to former title winners. In a season in which shot totals and goals have reduced year on year, defenses have defined the main storylines in the league, Southampton and Man Utd particularly. One can speculate as to factors involved; World Cup hangover, increased focus on the financial incentives or even Financial Fair Play but with the pragmatist’s pragmatist in charge of the leaders, it is no surprise that efficiency has come to the fore.